My Profile is where your your school records and stores information about you. You can get there by clicking My Profile in the main navigation views or by clicking your name in the black bar and selecting My Profile. You'll also want to take a look at your personal account settings, which you can read about in this article. If you're an active user, you'll see your bulletin board, info, and financial views. If you have the Staff role, you can see your activity feed. If you're a student (current or former), you can see select academic information (transcript, degree audit, courses, etc.) on the student view. Faculty and teaching assistants can see their courses on the Faculty view. This article covers the bulletin board, info, and financial views. You can add a short, 160-character bio right under your profile picture. Click edit bio, enter some text, and save. This will be visible to anyone who visits your profile. Export ID card: This creates a PDF of your school ID card. The ID card identifies you by whether you are Staff, Faculty, Student, or Library Patron (your ID card doubles as a library card). Make profile private: This option hides your profile from all users except Staff and your current Faculty and Advisor (if any). The Bulletin Board lets you post updates on your profile as well as messages and comments on other people's bulletin boards. Everything you do on a bulletin board—whether your's or someone else's—is public! That means that anyone at your school can see your updates, comments, and likes. Only active users have bulletin boards. If you're looking for someone's bulletin board but she doesn't have one, that's because she doesn't have an active user account. To post, just type or paste some text (URL's work, too!) into the field and click Post. You can use text formatting in your posts. You can post on your bulletin board or on someone else's. If you don't like your post, you can go back and delete it at any time. You can also post comments on bulletins; just click Comment and write something. Like a post or comment? Click the heart! To follow someone, go to their bulletin board and click the Follow... button. You can also look at a person's follower/following list and click the Follow button next to a person's name. When you follow someone, their posts and comments will appear on The Feed on your Home page. You'll also see update notices on your bulletin board. Likewise, your posts, comments, and likes will appear on your followers' Feeds. 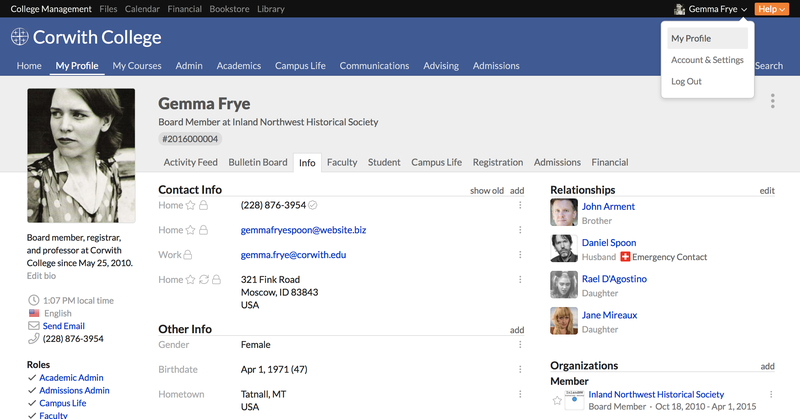 The info view shows you your contact information and any organizations of which you're a member (if you have the Staff role, you can see additional information in this view). Here you can add and manage your contact information. Click add to list a new contact item—phone, email, address, or website. Click mark old to archive an item. If you need to revive it, click show old and mark the item current. Click edit to change an item. indicates that this is your primary contact item of that type. In the above image, the 321 Fink Road... address is the primary address. indicates that this item is private: only staff and faculty members at your school can see it. Click the lock to make the item public—which means that anyone at your school with a Populi login can see this item. means that this item has been synced with someone listed as a relation (a roommate or a relative, for example). Verified means that this phone number and/or email address has been verified by you for the purposes of receiving text or email notifications from your school. To verify an item or change an existing verified item, see this article. Dashboard shows you current financial information like unpaid invoices. You can also come here to make online payments and download tax forms like the 1098-T or T4A. By Term contains financial information pertaining to specific academic terms. Here you can see your tuition and fees incurred for, say, your Fall Term courses, as well as financial aid, room and meal plans, and other payments. Click Print Statement to get a statement of all your term-related financial activity. Financial Aid details your financial aid awards and applications. History gives you a list of all your financial transactions—invoices, payments, refunds, etc. Read more about the financial information on your profile in this article.
" Private indicates that this item is private: only staff members at your school can see it. Click the lock to make the item public—which means that anyone at your school with a Populi login can see this item."